Across the globe, more than half the world’s population lives in cities, and there is a growing recognition that urban environments need to be more age-friendly. With its rich cultural offerings and easy access to stores, New York City looks like a great place to grow old. 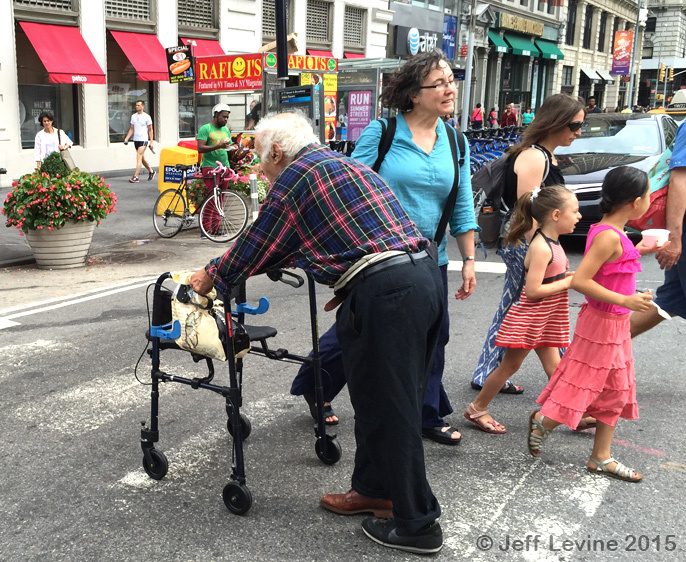 In this post I present photos of elders getting around the city. Go downtown in the early morning hours and you can see Chinese elders strolling and exercising in the parks and public spaces. 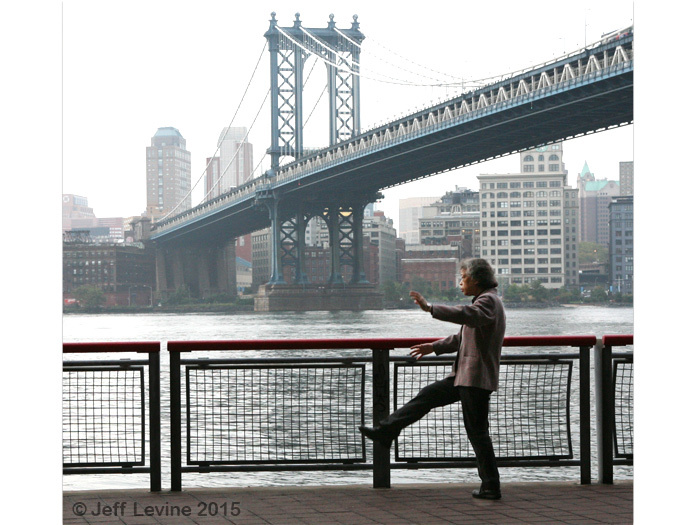 This is the Manhattan Bridge that spans the East River. Most of these shots were taken with my iPhone going back and forth to the hospital. The Bloomberg administration installed bike lanes all over the City, and these are favorite places for people speeding around on motorized wheelchairs, often in the wrong direction. This is a well dressed trio. 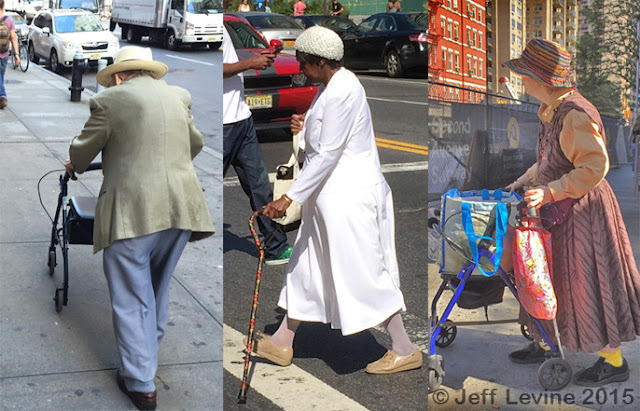 The lady in the middle was photographed going to church on 125th Street in Harlem, while the lady on the right was waiting for her ride. Uptown, midtown, and downtown you can see the universality of older folks taking care of their daily chores, going visiting or out to eat, or just strolling in the fresh air. Our aging society is in full view on the streets of Manhattan. 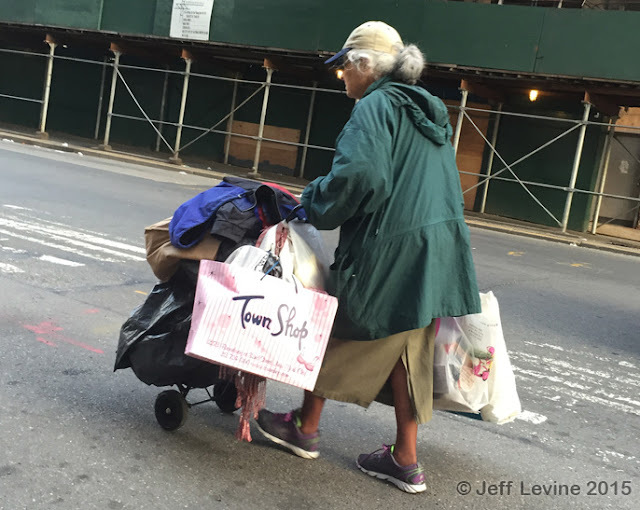 This lady might have had all her worldly possessions in tow. 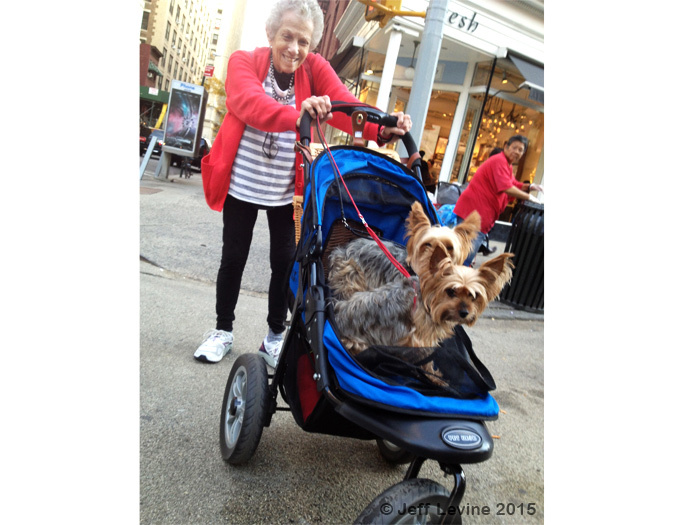 This lady in the Flatiron District gets double use from her dog caddy, getting the pooches around and assisting her ambulation. 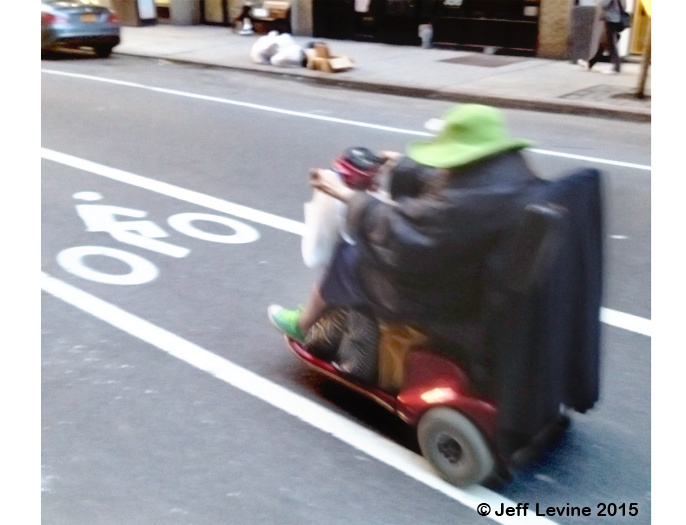 Stylishly dressed in matching hat and sneakers, this elder was going cross-town on 21st Street at a frightening speed. 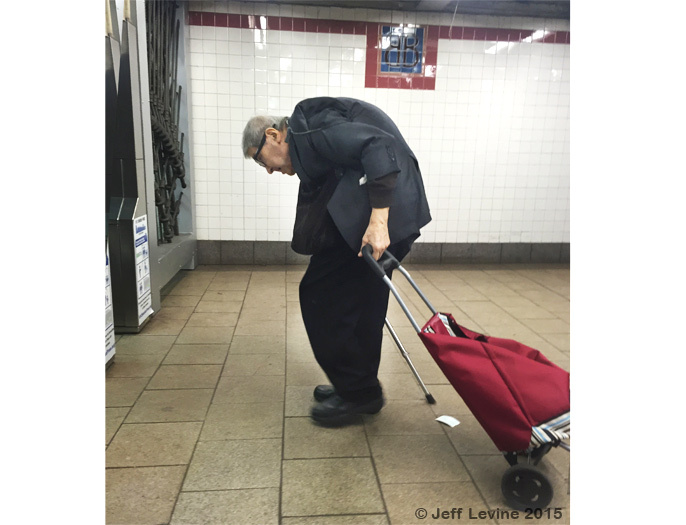 The subway is a common place to see elders, some struggling to get up and down the steps. Many of the stops, but not all, have elevators. 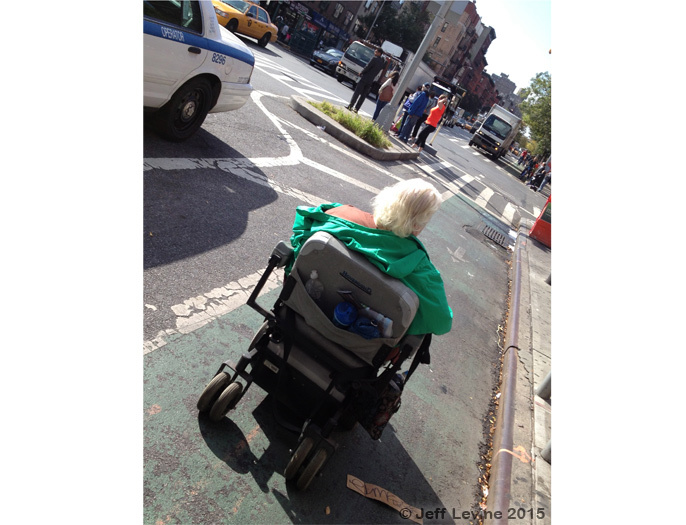 I watched with amazement as this lady made her way uptown on First Avenue in the middle of the bike lane, almost getting creamed by bicycles every other minute. 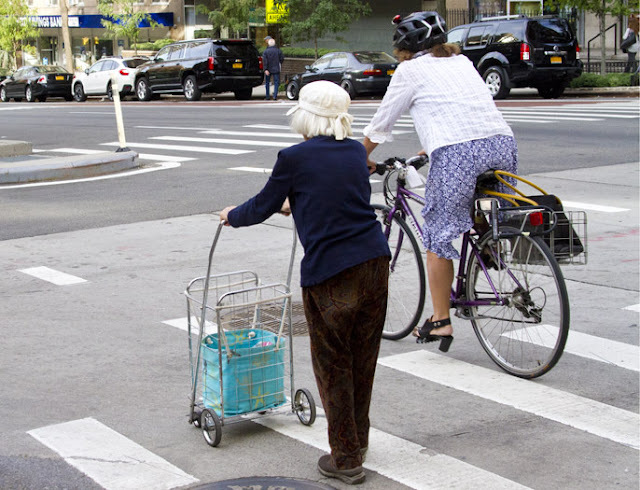 According to the website AGE-FRIENDLYNYC there are over 1 million people 65 and over living in New York City. By 2040 this number is expected to increase by over 40%. We as geriatricians are acutely aware of the shortcomings of our infrastructure with regard to our frail population, and the need to advocate for independence of our patients, informed choices on healthcare decisions, and a more age-friendly environment.